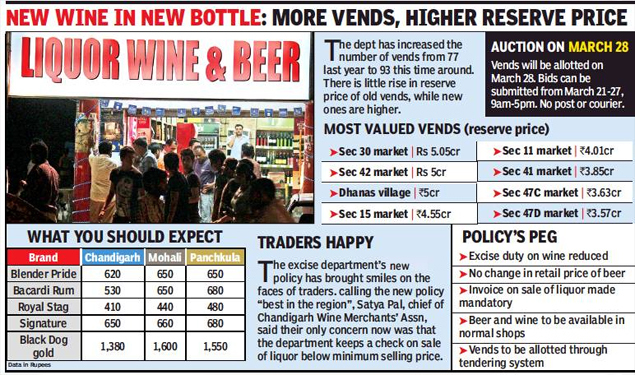 CHANDIGARH: Liquor in Chandigarh will continue to be the cheapest in Tricity, even after its increased prices come into force from April 1. The UT administration on Tuesday announced its excise policy for the next financial year. In the policy, it aims to earn a revenue of around Rs 450 crore, much higher than the Rs 354 crore it earned in the ongoing fiscal. Chandigarh has slightly increased licence fee, excise duty and other fee, and so have Punjab and Haryana. Over the years, UT has been consistently increasing liquor rates. Despite the rise, rates in city are less than those prevailing in Punjab and Haryana. According to sources, a bottle of Blender Pride will cost around Rs 620 in Chandigarh from April 1, while people will have to pay around Rs 650 in Panchkula and Mohali. Bacardi Rum will be available at around Rs 530 in Chandigarh, Rs 650 in Mohali and Rs 680 in Panchkula. A bottle of Signature will be available at around Rs 650 in Chandigarh, Rs 660 in Mohali and Rs 680 in Panchkula. Despite increase in annual licence fee, Chandigarh will continue to be the preferred destination for those who prefer draught beer for its freshness. UT excise and taxation department has increased the annual license fee for microbrewery from Rs 4 lakh to Rs 6 lakh, while Haryana has increased the licence fee from Rs 10 lakh to Rs 12 lakh. The rate of wine has been brought down in Chandigarh, with a reduction in excise duty. With UT making no change in the minimum retail sale price of beer, different brands of beer will be around 30% cheaper than Panchkula and Mohali. Chandigarh Hospitality Association president Ankit Gupta, however, felt that city-based restaurants and hotels would lose their competitive edge over those in Panchkula and Mohali. “There has been a substantial hike in different fee and duties, and this will push rates higher. We will be forced to pass on a part of the hike to consumers,” said Gupta. Excise department has incorporated new features in the excise policy which will come into force from April 1. To ensure that traders abide by minimum retail sale price, the department has introduced a penalty. For first violation, a trader will be fined Rs 1 lakh and Rs 2 lakh for subsequent violations. In Chandigarh, the malpractice of traders selling liquor below the minimum retail sale price is rampant. The department, in an attempt to promote low-alcohol content beverages, has paved the way for sale of beer and wine at petrol pumps, departmental stores and establishments for retail sale of confectionery bakery items, subject to a condition that the minimum turnover is Rs 50 lakh and they are registered under the Goods and Services Act. The outlets will have to create a separate area exclusively for sale\display of alcoholic products. The premises should be air conditioned and the outlets should have a computerised system for issuing bills. The department has also a introduced temporary license (L-12AA) for retail vends of foreign liquor with an aim to generate more revenue and put a check on illegal sale and serving of liquor. The department has also decided not to increase the number of bottling plants as the number of bottling plants is much higher than Punjab and Haryana.